It was a chilly March for the UK with incessant Easterly wind originating in the Arctic. The map provides very clear evidence. This is a new and welcome facility from RSS who seem to be working on a number of new datasets from various satellites, such as high stratosphere. I know there are some people who treat RSS as the devil yet I see no reason, they do excellent work, with slightly different results from UAH, both are useful. I agree. Since they come from the same basic set of instruments it is reasuring they produce similar answers. If only there was a Government agency that could provide reliable forecasting and predictions, build from known scientific principles and reliable records, to warn the populous, in good time, of such inclement weather. Sadly the Government appear to see no requirement for such a body or agency. Can’t be done much beyond what we have, chaotic, which is especially difficult at the unstable fringes. There are places where minds are concentrated, monsoon regions are one. Something I would like to see is the formation of a reasonably funded group of suitable individuals who are charged with figuring out an alternative view based based on Leroux’s work. He was well aware of this split. Seems to be nicely illustrated by recent re-emergence of talking about Icelandic low and Azores high, ridges of high pressure, in Met Office forecasts. Leroux pointed out neither exist are just an effect of averaging data where the underlying rapid movement of air masses is completely ignored. I’d noticed the unusual wind direction, beyond my memory so I went looking for data, meeting a wall of nothing. Cor blimey storms get recorded, wind, no, all you get is NAO and the like for long term. Tim, is there any kind of a publicly-available consolidated database of UK shipping forecasts/weather reports (from the Met, or otherwise)? I’ve often asked myself vague (and specific) questions relating to the coastal observations of wind, cloud, visibility etc. Whatever its current faults, the Met office must be sitting on some impressive data sets. Thanks for reminding me of this site, I used to watch daily updates of Arctic ice breaking up with their QuikScat updates years ago. I’ve bookmarked it. Hope that link works (you never know when a site uses ‘on page’ Java to navigate until after you’ve made the link). If the link did work, you’ll see the large clockwise wind circulations in the NH above the Pacific and Atlantic oceans. The ‘clockwise’ wind direction presupposes that they are regions of ‘high pressure’ and, if my assumption is correct, these are the ‘mobile polar highs’ (MPH) that Leroux refers to. These ‘highs’ may seem distant from a ‘Polar region’, but the land/ocean configuration at the NH Pole is such that the Polar Cell receives circulation energy at opposing ocean/landmass longitudes. Thus, the variant latitudes to the Polar Cell’s influence and the ‘circuitous route’ of the Polar ‘Jet’. These MPHs are altered in sympathy with Polar ‘Jet’ changes, again, in sympathy with ‘Polar Cell’ oscillations. Thus the term, ‘MPH’ (Mobile Polar High). If this doesn’t work I’ll need to talk you through it. The area I see that the most progress is likely to improve understanding is to identify and account for any short term natural cycles in the temperature data. We all understand and measure, day, season, weather and climate. We see individual irregular patterns (El Nino, etc) that are longer than a year but there I have not found any research into regular natural patterns that are longer than a year. 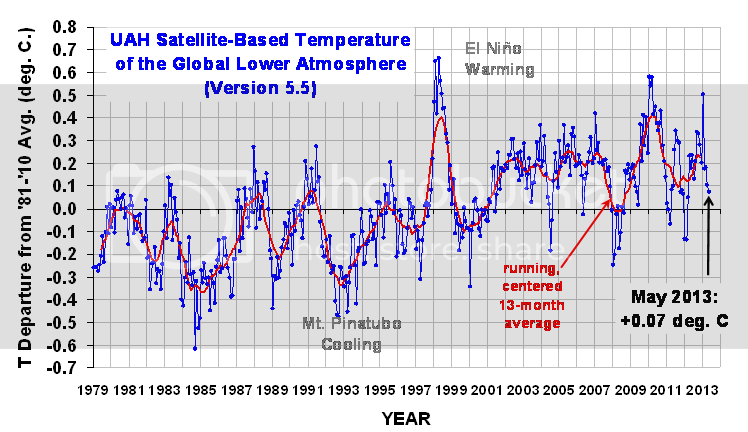 I believe that there is at least a 4 year cycle in the temperature data. That is, there is a pattern to the 1461 day full solar ‘year’. Not really surprising given that 365 is only a human approximation anyway. I think that we are destroying all the 4 year information in the data by chopping it into 365 day segements. We should instead use 1461 day ones. If we do then curious regular patterns emerge from long term series like CET. Do you want that put on the predictions page? But that is my point, this centralize computerized system can’t do it. Satellites alone can’t do it. Consider that back in the 1960 weather forecasters had little in the way of these things. What they had was many regional offices and area experts that, if they were good, knew and understood their area. Wind direction and speed were known locally. (IMO)The local forecasting could be a bit hit and miss at times but better than now. The overall forecast for the mass of national Britain has got better but the local has got very much worse. We appear to have replaced £million worth of local experts with £billion worth of computerized statistical approximation that can never get local enough. Yes he’s writing about climatology modeling and yes it may be a little different but in the main he voices what I mean. With a local experienced expert, his own measurements and observations, and the national information they should always be able to trump the big computer and it grainy nonlocal approximations, on the local scale. The local expert should have a better ‘feel’ for the chaos! Surely what is needed is a better symbiosis of techniques. @tchannon: What do you think of this presenational view of the UAT data? Richard if I understood what you are trying to do I might be able to comment. I have been using standard running mean filters (>3 stages to remove ‘square wave’ sampling errors) to analyse temperature data sources. Configured in a bandpass or cascaded low pass modes. The graphs attached show the output when looking at UAH. I have a CET set as well. Used in bandpass it show where is the perodic structure and where in time the ‘energy’ in the system is (and how it progresses through the system). Nodal analysis (local zero crossing) allows at least some guide as to the main frequency components. Given that there are only 10 samples of any shape at 3-4 years end and only 3 at the 12 year end the statistical resolution is poor (because of the length of the record) there is much still to look at. All standard singal processing techniques for short sample data really. I suppose all I am saying is that you can treat any temperature data record (such as UAH) as an audio data stream and use digital versions of well know audio techiques to uncover any low frequency information that may be present when it what ratios at given period ranges. The series based on 12 months (with a ratio component of 1.3371 to continue the set) provides an ideal digital one. It ‘nulls’ out the 12 month cycle without any need for ‘Normals’ of any length or period. This allows any other low frequency components to be examined visually. Then Nodal Analysis (by eye to start with) gives the likely cycle lengths. The conculsions then follow what I see. It also means that you need to treat all temperature data as a Julien day sequence rather than in any Calender. That sort of varying of the sampling clock has my engineering heckes up in a flash. A 28 day ‘smooth’ rather than any Monthly one preserves much more signal in the otherwise very noisy signal. And it means that 365 (and forget the oveflow for a bit) cannot be used, the first option is 1461 days for ‘Normals’ of any sort. The data is a mess for various reasons. Well here is a tool that allows you to look at it in a way that makes a lot more sense. At least to me. It has led me to predict the 18 month future for the UAH series (on Lucia’s). I think a first for verfiable answer within a reasonable timescale.